The West is getting a little less wild as Rockstar tackles online outlaws. 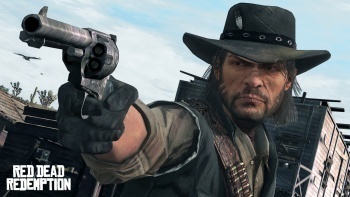 Following what it calls "isolated incidents of abuse," Rockstar is adding some new features to Red Dead Redemption to deal with online cheaters and griefers in a title update scheduled for release within the next month. Those who are being bullied in Free Roam mode will have the ability to get heck out of Dodge by transporting to an area of their choice on the map. In addition, any player who gets a kill streak of six or more in Free Roam will earn the dubious honor of being "Most Wanted," which means that every other player is alerted to their activities, and the game sends NPC lawmen after them. When it comes to actual cheating, Rockstar says that anyone found to be cheating "without a shadow of a doubt" will be banned from the game for an unspecified period. Rockstar adds that it will continue to monitor Red Dead Redemption's multiplayer and will continue to release updates as necessary. It's always good to see a developer taking anti-social behavior in a game seriously, and hopefully this update will make the game more enjoyable for people who had had a negative experience in the past.